When Martin Evening's revised tome on Photoshop arrived, we wrestled with it. At 730 pages on coated stock, it was no lightweight. We used two hands to carry it to our reading chair and groaned when we laid in our lap to page through it. So there's a lot to this title (enough to add it to our Bookshelf of Classics, in fact). And yet, as Evening points out, this version of the book is missing a few things. The companion DVD is one. But that material is now online at the book's Web site. Also missing are the Color Management and Web Output sections. The material in them hadn't changed in years, Evening explains, so he's made them available as PDFs at the book's Web site. And still the thing is a monster. Sharpening and Noise Reduction discusses sharpening techniques, looks at the various tools available, provides real world examples and covers noise reduction just as thoroughly. Image Editing Essentials distinguishes between bit-mapped editing and non-destructive editing and covers the available image adjustments and cropping. It's no exaggeration to call Adobe Photoshop CC for Photographers an encyclopedia. Fully illustrated, too. We can't guide you through each chapter in the book, so we thought we'd look at what is probably the shortest chapter. That would be Automating Photoshop. Evening admits he's among those who shudder at "the prospect of having to write computer code," but he bravely takes the topic on. He begins harmlessly by pointing out the utility of keyboard commands before dipping into Actions (including Batch processing, Conditional Actions and the venerable Image Processor script), while pointing out in sidebars Tutorial Builder at Adobe Labs and creating cross platform droplets. We're old hands at Photoshop, but we learned something on nearly every page we read. Often that came from a sidebar. He does briefly cover scripting and automated plug-ins, as well. As we compiled the topics covered in the table of contents, we imagined a number of them would not be familiar. And while you could scour the Web for various click-bait explanations and tutorials, life is short. You need a reference book. 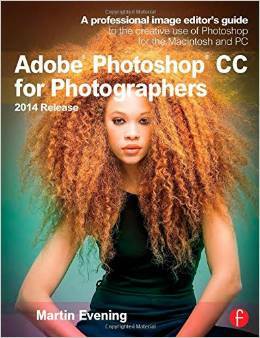 We've come to think of Adobe Photoshop CC for Photographers as just that reference book. It's very clearly written, explaining the concepts simply before putting your new knowledge to use with step-by-step tutorials that demonstrate what's so important about the topic. The Step Interpolation side bar on page 338 is a good example. For years, Photoshop experts have taught that changing image size in 10 percent increments retains the most quality, particularly when increasing the size. We even have an Action in our Subscriber Benefits utilities to do it with the click of your mouse. But Evening points out that Bicubic Sharper/Smoother with the new Preserve Details option and slider controls can beat that in one step. The real question is how to navigate all this material. Some chapters, like Photoshop Fundamentals, deserve an session all to themselves. But once you've got your feet wet with the program, the book serves its reference role admirably. What you can't find in the Table of Contents, you'll see in the Index. Handling the heavy book itself is the worst part of navigation. But there's a solution for that, too. A Kindle version is available for $40.71. You'll use the book often enough, though, that we suspect you'll develop significantly improved biceps and forearm strength to the point where it won't bother you much to pick it up and flip to the information you need. Evening, a studio photographer himself, was inducted in to the Photoshop Hall of Fame in 2008. He relies on Photoshop to do his post processing, which inspires the real world examples in the book. We've come to think of him as a sort of Virgil who guides us through the circles of image editing hell while keeping us safe from the pitfalls and pains. You will too. Adobe Photoshop CC for Photographers by Martin Evening, published by Focal Press, 730 pages, $59.95 (or $42.85 at amazon.com).